This entry was posted in Comments about Cycling on January 16, 2017 by Steve Tilford. Last year, right around cyclocross Natz time, Kurt Searvogel, broke the distance record for cycling in a year. He rode a tad over 76000 miles. 76076 to be exact. But that record is under siege. Down in Florida, Amanda Coker is riding her bike everyday. Like all day, everyday, for the past 246 days. She is riding a long ways, a long time and pretty unbelievably fast. Take yesterday for example. 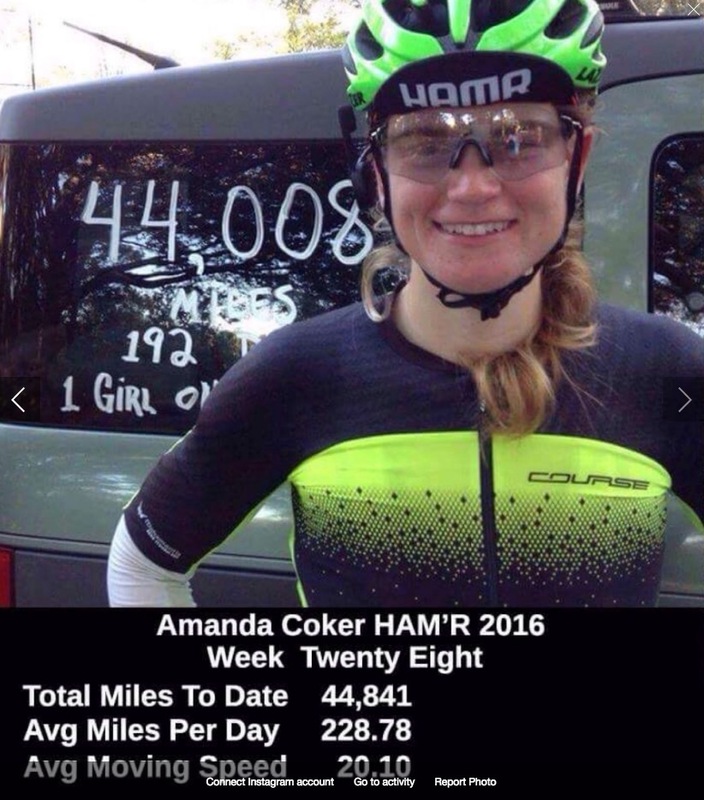 Amanda rode close to 242 miles in 11 hours and 35 minutes. That is a 20.8 mph average. And she has been doing pretty much something like this for 2/3 rd’s of a year. She has already broken the women’s one year distance record for cycling. She did that in 4 months. Think she might be putting that record out of touch for a long time. If you do 240 miles a week, you’re gonna have a 12, 400 mile year. But she is doing that many days. I think, so far, she has averaged about 228 miles per day, so she is on schedule to ride over 83,000 miles for the year. That is 7 thousand miles further than Kurt. I am baffled. Impressed immensely, but baffled. There are so many parts of this that is crazy. I’ve never ridden 240 miles in a day in my life. Not even close. And here is a girl that is riding close to that everyday for months upon months. And she is averaging over 20 mph. The speed is nearly more impressive than the distance. I’m sure she must be riding in a group most of the days. I can’t see an average speed that high without other riders. But even so, 11 + hours a day on a bike, you’d think the speed would drop. I don’t understand how she can eat enough food to do this. It has to be close to 10000 calories a day. Man, it is amazing. Plus, her heart rate is super low. Yesterday her pulse was 114 bpm average. That was for nearly riding 21 mph for 11.5 hours. Pretty impressive. I’m not sure why the regular cycling media has been following this more closely. It is worthy. Anyway, I’d like to go down there and ride with her some. I actually plan on it. I am pretty sure I couldn’t do a whole day with her. Not without training a ton. She just has less than 3 months left. I’d better get fit soon. You can follow her on Strava. This is her a few weeks ago. From Strava. Check out this mileage. Amazing. She is pretty much riding the same course everyday near Tampa. Pretty good plan. Incredible I hated riding in Florida you Always end up on a major hwy with shitloads of traffic, Caddies, Orange Trucks, blind people?! No shoulders on the roads you just eat it into swamps and become Gator Bait! What you think Danny you were our Mileage Marathon Hero?! That average speed Might even be faster than the record at RAAM for men?! Awesomeness!! She’s on Strava. Yes, sometimes with others, but far more solo. She does loops in different areas & flat. And people take her to task for lack of elevation! Go ride your bike people! Just the logistics to pull it off is amazing! I cannot comprehend even driving a car that far every day. God help the field if she ever competes in any endurance events. Go get em Amanda Coker! She’s trained for this, so the low HR doesn’t really surprise me. Super fit cardio system for sure. Big gear, low cadence and flat roads, skinny tires, aero rims, etc. It all adds up to a lower effort. I’m impressed that she and Kurt managed to not have any repetative stress issues so far. She’s also riding a recumbent on flat roads lying on her back. That can explain few things. Are all her bikes checked for batteries and motors, btw? Pretty amazing anyway… just sitting (or lying) on your bike for that long every day. Guess it doesn’t rain or snow much over there. Strava has changed the way we ride. Wait, she is on a recumbent? She is riding “both types of bikes”. I find it a little bit disingenuous that all of the pictures from all of her media sites show her only on road bikes. I get that recumbents are allowed by ultra mileage rules, but there ought to be an asterisk or something. John H.- I don’t know the “rules” for setting the year endurance record on a bicycle, but I do know that Kurt rode a recumbent sometimes too. Most of the photos and videos I see of Amanda, she is riding a “normal” bicycle. I don’t really care. The feat is very impressive. I really don’t understand how her body can absorb the constant pressure day after day. I am still very impressed. But 240 a day on Recumbent is not 240 a day on a road bike. I mean, could a human body even take that on a road bike? Repetitive Stress Injury would do you in in months I would think….then again, incredible things happen all the time. Still, I wish there were at least one photo around all the sites I found talking about it/promoting it that showed her also on a recumbent. Also, while I am throwing wish-horses around, I would like to know the percentage of Road/Recumbent. Also, I want a pony, and Golden Ticket, and to be 20 pounds lighter without making the effort. I’ll just be quiet now. Most amazing thing? Proportion of the total time that has taken place in the last 8 months, she has been moving on a bicycle 47,3%!!!! That seems like an awful lot of miles at an insane high pace with an incredibly low heart rate that beats out the best men in ultra-endurance. I’ve ridden with Danny Chew enough times and seen what a few weeks of continuous double centuries does to a person to have a tiny little question mark here. I went to Flatwoods Wilderness Park a few weeks ago to see Amanda during one of her daily rides there. Either her Mom and Dad will be at the small parking lot (near 14302 Morris Bridge Rd, Thonotosassa, FL 33592) – it’s easy to find them – they’ll have a van or the Honda with Amanda’s total mileage written on a side window. Her parents are easily approachable and I would suggest talking with them so they can get to know you… Have them introduce you to Amanda. She comes into that parking area for a “pit stop” or to change bikes every so often. They want to make sure that Amanda is safe at all times and are wary of unknown riders that may cause an unwanted incident (“wobbly wheeling” next to her to try and cause her to crash, ride in front of her then braking heavily for no reason, groups of riders boxing her in and then riding slow to try and ruin her avg. speed, guys trying to flirt or hit on her…) These were some of the reasons they gave… They are *super* protective of her – can’t really blame them as they have an incredible amount of time and $$ already invested. Later while out on the 7 mile bike loop (it’s bicycle and walker/runner only) I saw her drafting with an older friend of hers (on their 700c wheel recumbents…) Doing about 21 or 22mph. I wanted to start riding with her and say hello, but like I said, I don’t know how she would have taken that. So I said nothing and let them ride on. Kind of a bummer – looking back on it now I would have like to have said some encouragement to her, but I certainly got the impression after speaking with her parents that unwelcome attention from other riders towards Amanda was a big problem for them. Other notes: She rides in the gated community in the mornings for a few hours (just north of the Flatwoods Wilderness Park), then rides down to the forested 7 mile cyclist/runner loop for most of the day. It’s paved and wide as an automobile road. There are all sorts of people on it even during weekdays. Little kids on bikes, rollerbladers, dog walkers with those retractable leashes stretching across the road… Kids and dads with fishing poles along their bike handlebars…. So it’s not always easy to hold a 21mph average. And there is almost always wind to deal with. She rides a recumbent for the majority of the day’s miles. It has 700c wheels front and rear. There are plenty of other retired riders that ride that loop daily, so she always has somebody to ride with if she chooses. Aside from that loop road, road cycling in that area of Florida is very dangerous. 1. Many roads have NO shoulder. 2. Incredible amount of 70, 80, 90 year old “snowbirds” still driving down there – retirement communities everywhere. That 7 mile loop is an oasis in a desert. But central Florida is a very boring place to ride… I’m so glad I don’t live there. I did a only a few laps of Flatwoods Wilderness Park bike path and was bored… She’s doing it for 230 miles a day, every day for a year! It boggles the mind… Reminds me of Danny Chew and his commitment. But at least he rode new roads every day… No way one could ride 80,000 miles in a year in Pittsburgh though. If you want the 1 year mileage record, you have to do it in Florida where the weather is 80’s even on January 1st. And you have to do it on a loop road where there is no chance of an incident with a car. It is an absolutely incredible commitment that Amanda and her parents have undertaken. Hope she gets the record. Man, good for her! That is awesome. How freaking boring. I am both more and less impressed. Must be like Groundhog Day on that 7-mile closed loop. Like a never-ending 6-day race on a velodrome. But this is on a shared road with her dodging rollerbladers, dogs and children. I wonder if they love or hate her? How does anyone afford to do that? Without my job, I wouldn’t eat, have shelter, clothing, etc, much less a bicycle, tubes, tires, etc. But wow, do I feel lazy in comparison! whatever bike, for whatever reason, at whatever speed – this is an amazing feat. that she’s averaging 20mph makes it all the more amazing. Impressive, I guess, but sort of in a boring way. I wouldn’t be pleased if my son said he wanted to set such an arcane, potentially dangerous, and difficult record. I mean, who really cares? What’s the payoff? Payoff? If your whole life is about a payoff, you have my condolences. Did Rita Wilson ever try anything like this? The big gear, all day, low cadence aero wheel situation reminds me of her. Does not seem possible these average speeds at this distance. Sounds dangerous on a multi use trail to be riding this fast with other slower trail users. I now do most of my riding on a multi use trail (sorry, but I’ve had too many close calls in recent years). It’s not so bad. You just have to politely make people aware that you’re about to pass them. Every so often, it even means coming to a full stop. No big deal. I never have any traffic lights, and no getting sideswiped by F-150’s with texting drivers behind the wheel. Paradise. I just get to ride all I want, no hassles. Thankfully, I’m blessed with close proximity to an awesome bike trail system (in Phoenix). Does this mean a double-wide stroller every so often? Yeah. The worst obstacles are the “Sylvias”. The exercising housewives who go out in groups and incessantly gossip while they walk with latte’s in hand. They never step aside. And God help you if you say anything cross to them. Hey, watch it with the insults, or I just might get sore ‘atcha! Tom Hanks’ wife is an endurance cyclist? Must ride like Forrest! Or, maybe, she found something she wanted to achieve and figured out a way to do it in the safest manner possible? Honestly, anyone that goes after something big has to hyper focused on the goal in front of them. Aww…don’t be a chicken, Krak. She had a closed head injury– she isn’t autistic. Still quite amazing dedication! Guess she could smoke Chris Strasser at RAAM without dropping a sweat. John H., I follow her on Strava and FB and know several of the people who ride with her (when their work and life schedules allow) and she is riding standaard and recumbent bikes almost equally. One reason, and this is just one, she is able to pull off this kind of mileage is that she doesn’t have a job that I’m aware of and her only family are her parents (and possibly siblings?). But, the bottom line is this effort, like it was for Kurt, is her current only job. No spouse or kids to tend; no employer to please and no customers to wait on. She might be getting some level of compensation from sponsorships that I’ve seen her leverage…but that hardly amounts to a time commitment. She’s doing a great job from what I can tell and i hope that she’s doing it all clean and on the up and up….she’s given no reason to think otherwise.